Are You a Good Hair Transplant Candidate? Some factors can influence your suitability for a hair transplant surgery. Are you a good candidate? Getting good results from hair transplant is more complicated than it looks. Several factors have to be considered before deciding whether a hair transplant surgery is a good idea for you. Before you go to the hair loss clinic for a doctor’s appointment, make sure you know the factors so you can evaluate the responsibility of your potential surgeon. The biggest factor lies in your expectations. If you expect that a hair transplant will bring back the hair from your teenage years, think again. Although it will help hide the effects of hair loss, you will never regrow a full head of hair like when you were young. You should also consider alternative methods before resorting to surgery. There are plenty of shampoos, topical solutions and oral medications available to stimulate hair growth and thickness. Explore these options with your hair specialist before going the more drastic way of surgery. If you’re completely bald, no surgeon will ever be able to transplant hair—you have none to move. A good surgeon will evaluate your hair fairly and tell you what kind of results you can realistically expect. It’s tempting for younger men to go through to the transplant right away—men in their 20s and 30s are especially desirous to maintain their self-esteem and appearance. However, it might be better to be patient and see how much hair your end up losing. A transplant too early might leave a patient with little hair to spare when, later in life, more extensive hair loss sets in. Heredity is a big factor in this case. It’s therefore recommended that younger men use other methods while waiting to see how much hair loss will actually affect them later in life. The best candidates are usually in their 40s and understand their family history. 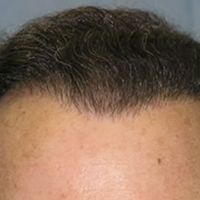 Often, multiple hair transplants are required as the hairline recedes with time. Someone hoping for a one-time stop to full hair will be disappointed. Money is thus an important factor: are you willing to spend a few thousand dollars at regular intervals to maintain your hair? Usually, the best candidates for hair transplant surgery are in their 40s, have been balding for at least five years and the hair loss patterns have stabilized. These men have realistic expectations of the results and are aware that there might be more hair loss after the surgery. Trauma and burn patients are also good candidates for hair transplant surgery; these cases are considered “reconstructive” surgeries and are often covered by health insurances. Wavy or curly hair is better than straight and thin hair because it’s denser and easy to style to make it look more voluminous. Pale hair on pale skin is also preferable as imperfections show less than with dark hair on pale skin. Dark hair on dark skin works well too. The best person to evaluate your suitability for a hair transplant procedure is your hair loss clinic surgeon. Visit one for more information on hair transplant and other solutions to hair loss. Hair transplant can be out of reach for some people who are balding because it may be too expensive, usually through male pattern baldness. So you may like to try other ways to stop losing your hair such as applying medications like minoxidil on your scalp or take Finasteride more commonly known as Propecia to see how effective they are for you. Even if these medications work for you, you will need to continue using them to maintain the results.